My comments on the batteries performance is at the bottom of this article. I will post updates over the coming months to let you know how the battery is lasting. I have a Nokia E63 phone which needed a new battery as the original battery was four years old and barely held a charge for a day. I spent some time looking for an original genuine Nokia replacement battery but kept finding ones that in reviews on Amazon and other sites were being reported as fakes. 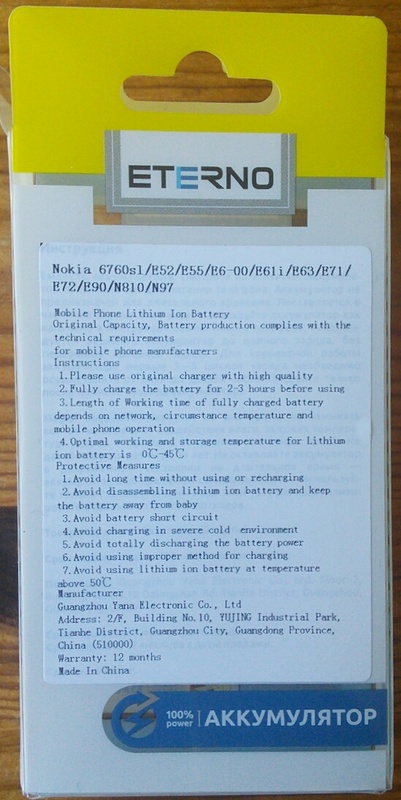 There were some stores that did sell the original BP-4L Nokia battery for around £16 to £20 but were out of stock. I decided that I would need to go for a compatible battery but again finding a good quality battery took some research. Generally the cheap batteries that claim to be genuine for only a few pounds found on Ebay and Amazon will be fake. Alternately replacement non Nokia batteries that are cheap are probably poor quality batteries that will only last a few weeks or months before the battery you replaced it for worked better. For my E63 phone it seemed that batteries for £10 or over should be better quality replacement batteries. Chinese batteries are commonly considered low quality and Japanese batteries are considered good quality. Though this s a general statement a lot of fake goods do come from Chinese sellers. I then came across the Eterno mobile phone batteries being sold on Amazon. Originally I ignored them because there was no reviews but then decided to take a closer look as Amazon was selling them as fulfilled by Amazon meaning they were being despatched by Amazon and not the third party seller which gave me more confidence that they were not a poor product. Amazon also sell them on their French and German sites. I have had this battery a couple of month now and charged it several times. Each charge has lasted 4 to 6 days which is good. I use to get around 4 or 5 days from my original battery when it was working well. The extra days i’m now getting will be because my phone is no longer my primary device for email so I’m putting less demand on it. 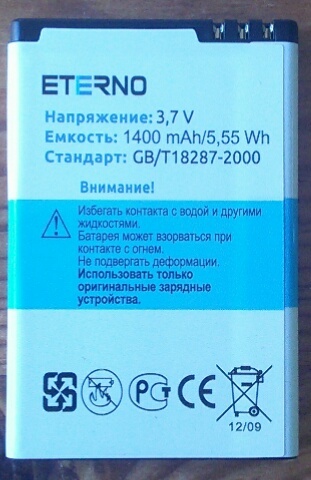 The original Nokia battery was rated at 1500mAh, the Eterno battery is rated at 1400mAh so holds slightly less charge. My phone is currently on 24 hours a day for two wake up alarms, moderate internet use over wifi, a torch, a few phone calls and texting. 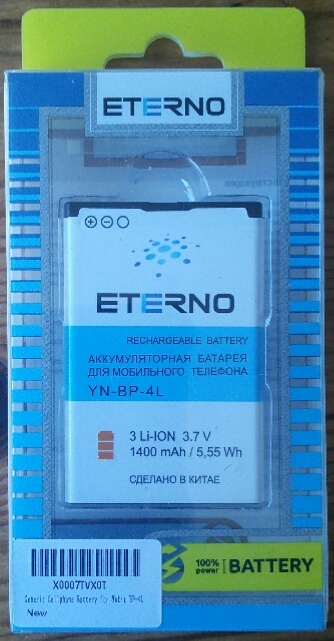 I am happy with the current performance of the Eterno battery which has breathed new life into my phone. I will update this review regularly over the next few months to report on the continuing performance of my battery. Sofa so good. After 3 month the Eterno battery is still performing well. I have kept a log of when it has needed charging which shows it is mostly lasting 6 days between charges. My phone is on 24 hours a day. After 5 and a half month I am happy with the performance of the battery which on average is consistently lasting 6 days between charges. It has been 1 year since I started using this battery and it is still lasting 6 days on average between charges. It has been very consistent and reliable and I would defiantly buy this brand again if available for any other battery requirements I may need in the future. The article has been independently written and I have not been contacted or received anything from Yana Electronics. This entry was posted in Reviews and tagged battery, BP-4L, eterno, mobile phone, nokia, X0007TVX0T, yana electronic, YN-BP-4L on November 1, 2014 by digiblog.